7th Marine Regiment (3/7), 1st Marine Division, I Marine Expeditionary Force. On November 10, 2004, while fighting with his unit, an enemy soilder threw a hand grenade that landed next to him. Rather than allow the grenade to explode and kill or injures everal other Marines in the area, Cororal Dunham sacrificed himself by diving on otp of the grenade. When it exploded, he was seriously injured and died eight days later. 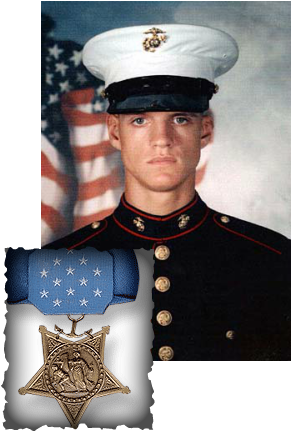 accounced that Corporal Dunham would be awarded the "Medal of Honor" for his actions on April 22, 2004. 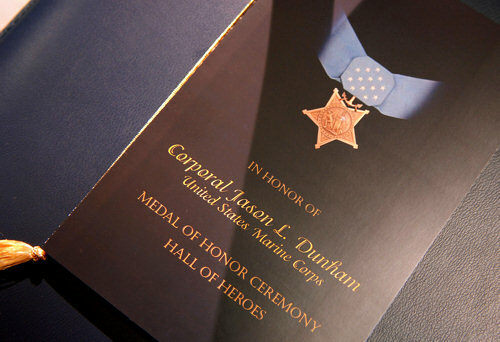 Corporal Jason Dunham became the first Marine to receive the Medal of Honor for actions in Iraq, and the first Marine to receive the Medal of Honor since the Vietnam War.